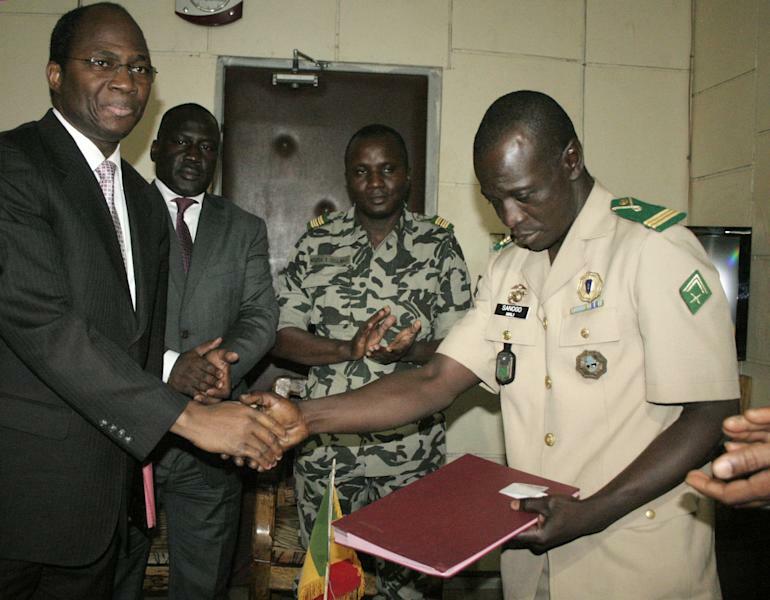 BAMAKO, Mali (AP) — Under intense pressure from the nations bordering Mali, the junior officer who seized control of the country in a coup last month signed an accord late Friday, agreeing to return the nation to constitutional rule. The announcement came only hours after separatist rebels in Mali's distant north declared their independence, a move that further complicates a crisis that began 16 days ago when a group of disgruntled soldiers stormed the presidential palace, reversing two decades of democratic rule in the space of a day. On Friday, Capt. 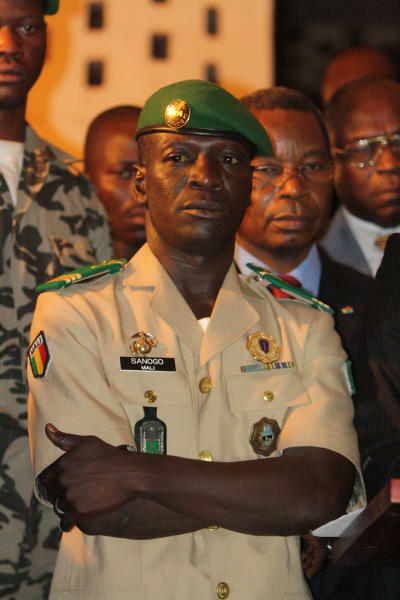 Amadou Haya Sanogo emerged from his office inside the same military base where the mutiny began and which has acted as the de facto seat of government ever since the March 21 coup. Flanked by the ministers of neighboring nations, he read out the accord, stating that under Article 36 of Mali's constitution the head of the national assembly becomes interim president in the event of a vacancy of power. The head of the parliament will form an interim government, which will organize new elections. "In the event of the vacancy of the presidency of the republic for whatever reason, or due to any absolute and definitive impediment," Sanogo said, "the functions of the president of the republic will be exercised by the president of the National Assembly." However, the accord did not say what role the military junta will play in the future. It also did not state when the head of the assembly will assume the post, or how long the transition will last before new elections are held. Dioncounda Traore, the head of the assembly, fled Mali after the coup. Although article 36 of the constitution says elections should be held in no more than 40 days, the accord explains that that timeframe will likely be extended, due to rebellion which has turned the northern half of the country into a war zone. "Because of the exceptional circumstances that the country is going through, because of the institutional crisis and the armed rebellion in the north which have badly affected the functioning of the institutions of the republic and because of the impossibility of organizing elections in 40 days as set out under the constitution," Sanogo said. "It is indispensable to organize a political transition with the aim of organizing free, democratic and transparent elections." The declaration was welcomed by Burkina Faso's Foreign Minister Djibrill Bassole, who flanked Sanogo while he read the accord. Bassole said afterwards that the nations bordering Mali had agreed to lift the crippling sanctions which went into effect earlier this week, including the closure of the country's borders. Landlocked Mali imports all its fuel, and already many neighborhoods in Bamako had only electricity for half the day. A senior official who was involved in the negotiations said that the head of the assembly would likely fly back as early as Saturday. He said that the accord means that Sanogo — who just days ago had stubbornly refused to step aside — has finally chosen to put the country back on a democratic path. A Western diplomat in Bamako, however, said that although he hoped for the best, he worried Sanogo could still make a U-turn. Neither the official nor the diplomat could be named because they had not been authorized to speak to the press. "We have to take a wait-and-see approach," the diplomat said. "I certainly hope it's true and that the country goes back to civilian rule so that Mali can get back on its feet." The news comes just hours after Mali's Tuareg rebels, who seized control of the country's distant north in the chaotic aftermath of the coup in the capital, declared independence Friday of their Azawad nation. In Ivory Coast, the military chiefs of 13 of Mali's neighbors met to hash out plans for a military intervention in order to push back the rebels in the north. The confusion in the capital created an opening for the separatists. The traditionally nomadic Tuareg people have been fighting for their own homeland since at least 1958, when Tuareg elders wrote a letter to the French president asking their colonial rulers to carve out a separate nation, called "Azawad" in their language. Instead, the north, where the lighter-skinned Tuareg people live, was made part of the same country as the south, where the dark-skinned ethnic groups controlled the capital and the nation's finances. The rebel group that declared independence on Friday is secular. However, they were helped by an Islamist faction which is now attempting to apply Shariah law to Mali's moderate north, including in the fabled tourist destination of Timbuktu. France has offered to provide logistical support to the Economic Community of West Africa States, or ECOWAS, the 15-nation bloc representing nations in the region, should they decide to launch a military operation to reclaim the north. When they first seized power, Sanogo and his men said they were ousting Mali's democratically elected leader because of his poor handling of the rebellion in the north, which began in January. The conflict has cost the lives of scores of Malian soldiers, and in the accord signed in front of reporters on Friday, there is also a section calling for reparations to be paid to the families of the dead soldiers. In addition, the accord gives full immunity to the soldiers that took part in the coup. Left unanswered is the fate of ex-President Amadou Toumani Toure. Toure, known by his initials ATT, went into hiding and his whereabouts remain unknown. 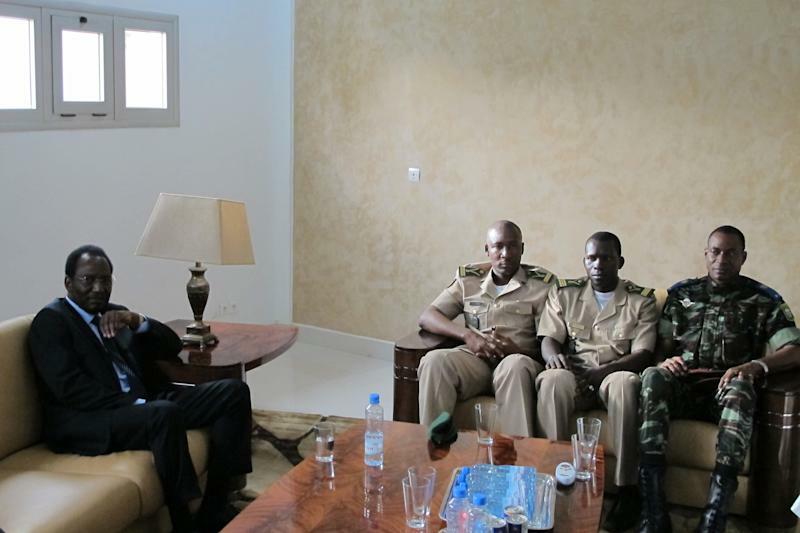 Bassole told reporters after the coup leader read the accord that Mali's neighbors had made a heartfelt appeal for Toure to be allowed to return. "We also expressed our desire that President ATT be allowed to return to the home of his choice, and that his security be assured by the defence and security forces," said Bassole. The accord does not specify if the junta has agreed to that request. Associated Press writers Baba Ahmed and Martin Vogl in Bamako, Mali contributed to this report.